Over 70 tourism stakeholders from across Canada gathered in Ottawa on March 6 and 7, 2019, to examine the skills and labour issues hindering the growth of the sector and strategize on multiple initiatives to strengthen its future. Hosted by Tourism HR Canada at the Delta Hotels by Marriott Ottawa City Centre, the event is a key part of the organization’s aim to create a more resilient and inclusive labour market. Delegates represented the many groups influencing tourism’s success, including business, education, labour, industry associations, and government. A complex interplay of key drivers—political, economic, social/cultural—inform the policies and programs that focus on labour supply, skills, or mobility. An aging population, a growing global middle class, soaring interest in Indigenous tourism, misconceptions of tourism employment, housing costs, and immigration are among the many aspects influencing Canada’s tourism sector. 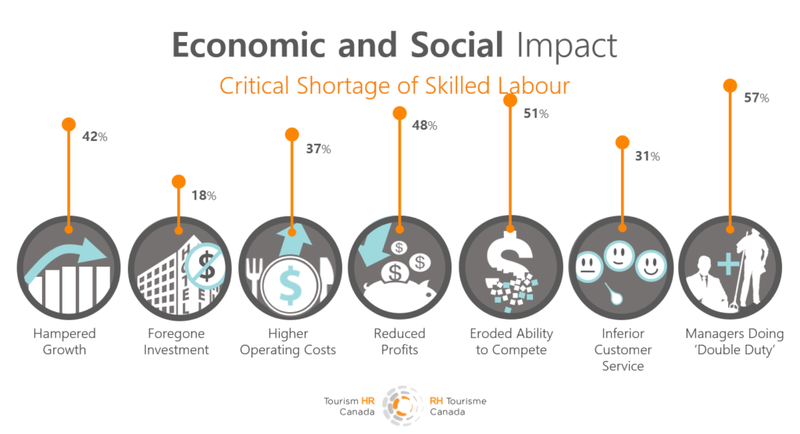 Tourism HR Canada framed the labour crisis, sharing in-depth research and analysis of the labour market. Currently, Canada’s unemployment rate is 5.8%, the lowest since 1976. The tourism sector’s unemployment rate is 4.9%; it has been consistently lower than the total Canadian economy since 2009. Just under 100,000 tourism jobs went unfilled between 2010 and 2017. Current projections show another 145,000 could go unfilled by 2035. With the increase to Canada’s immigration intakes announced in late 2017, the sector may benefit from as many as 85,000 jobs being filled by newcomers. The remaining labour shortfall, however, still prevents Canada from gaining a much larger share of the global tourism market and increasing its global standing and competitiveness. Each national association—Tourism Industry Association of Canada, Indigenous Tourism Association of Canada, Hotel Association of Canada, Restaurants Canada, and Destination Canada—reported on the labour market challenges members have voiced, with sobering and salient messages attesting to impacts of a ‘tight labour market’. All talked about difficulties finding workers (from entry-level to the C-suite) and having to reduce services in spite of growing consumer demands. Employers report that the shortage of workers has many social and economic impacts. Each group shared their experiences and offered innovative ideas to build solutions to these and other labour market matters. Tourism HR Canada will incorporate their expertise and feedback into strategies and programs to support the sector—core to its role as Canada’s authority on the tourism labour market. The next Tourism Labour Market Forum will take place March 4-5, 2020, in Ottawa. Subscribe to Tourism HR Insider to keep informed on this year’s outcomes and next year’s plans.